Tooth decay — or dental caries — is an infectious disease process that causes damage to the structure of teeth. Cavities (hollowed out spaces or holes) are the most notable consequences of dental caries. Left untreated, caries leads to pain, tooth loss — or, in rare cases, death. In this most extreme case, infection can advance to the “cavernous sinus,” an air cell behind the eye, from which it can then enter the brain. Tooth decay amounts to more than just the inconvenience of “drilling and filling”: it has the power to change a person's diet, speech, quality of life and overall well-being. This article — the first in a series about one of the world's oldest and most widespread diseases — will explore the most current information about tooth decay. This and subsequent articles will provide you with all the information you need to know about tooth decay, its causes and its relationship to sugars and acids, detection, prevention, treatment and more. In future articles we'll also discuss new diagnostic and detection methods, the role of fluoride in the prevention of dental caries, and the latest in other prevention and treatment options. Did you know that tooth decay is one of the most common of all diseases, second only to the common cold. Oral diseases range from cavities to cancer; they cause pain and disability for millions of Americans each year. Even more disturbing — almost all are preventable. Dental decay is a worldwide epidemic, especially among young children. The disease begins early — tooth decay affects more than one-fourth of U.S. children ages 2 to 5 and half of those ages 12 to 15. Low-income children are hardest hit: about half of those ages 6 to 19 have had decay. In addition to pain and other dysfunction, untreated cavities can cause absence from school and other social interactions, low weight and poor appearance — problems that may greatly reduce a child's capacity to succeed in life. 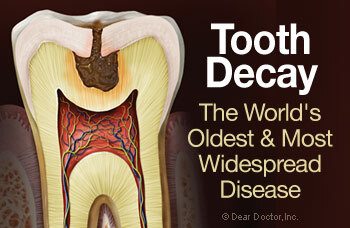 Tooth decay is also a problem for U.S. adults, affecting more than ninety percent over age forty. A quarter of adults over age sixty have lost all of their teeth primarily because of decay affecting self-esteem and contributing to nutrition problems by limiting the types of foods that can be eaten. The mouth is an ecosystem where living organisms continually interact with every other element within their environment. The teeth are composed of an outer covering of non-living enamel (the hardest substance in the human body) and an inner core of living dentin, with a consistency and composition similar to bone. Enamel is highly mineralized and crystalline in structure, composed mainly of calcium and phosphate. The teeth are bathed in saliva, a most remarkable and seldom discussed fluid. It has many important functions in keeping mouths healthy; one of the most important is its role in maintaining a “neutral” environment — a balance between acids and bases. Tooth decay is also a problem for U.S. adults, affecting more than ninety percent over age forty. The oral environment is also loaded with bacteria. There are more bacteria in a single mouth than there are people who have ever lived on the earth. Certain of these bacteria have the potential to cause decay.